If an iPhone game can surprise me, like Magnetic Baby does (but just a little), it's because I seem to have become accustomed to playing with gravity and leaping through wormholes and understanding the physics of sentient little blobs in my video games. In Bravery Plus' Magnetic Baby, you control a cute orange blob with glistening eyes and a haircut desperate to reunite with his cuter pink counterpart. Our heroic blob can leap from planet to planet—some spherical, some bean-shaped, some that look like bumblebees, some that look like exotic fish—using speed and the gravitational pull of miniature heavenly bodies to control his path. Pop through teleporting "phase gates" to move through space. Collect stars along the way to be graded better on your performance and avoid the numerous dangers—rotating spikes, rough terrain, etc.—to survive. 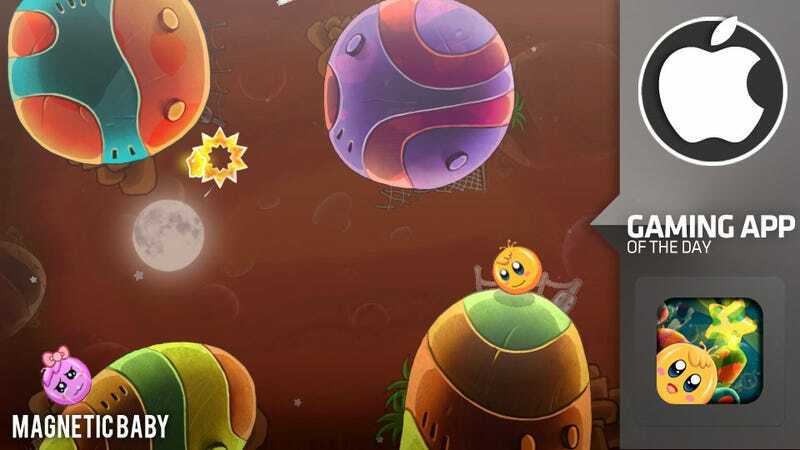 Use physics and careful control to solve puzzle-like levels that require experimentation. Save and snuggle with your pink ladyfriend with the bow in her pink hair. You may be reminded of more popular iPhone fare like Soosiz or Gomi or Tiny Wings when looking at Magnetic Baby. Or it may smack of Loco Roco and Super Mario Galaxy, simplified. The game does not astound with its originality, even using some physics-plus-multi-colored portals tricks to add a pinch of variety. What Magnetic Baby lacks in creative new gameplay it makes up for in charm. The blobs and planetoids of Magnetic Baby are cutely designed, popping with bright textures and endearing expressions. If it weren't so expertly adorably made, it would lose much of its appeal. Magnetic Baby offers three distinct ways to control the rolling and interplanetary leaps of your blob. You can tilt your iPhone or iPad to guide the blob, drag lines to direct, then release to jump or (my preferred method) use an on-screen joystick and jump button. Tilting turned out to be my least favorite control implementation, after a few crazed twisting and rotating sessions that left me in fear of dropping my iPhone. Magnetic Baby doesn't do a whole lot new, but what it does, it does it with a redeeming style. The iPhone, iPod touch and iPad versions are just 99 cents, making this a guilt-free purchase full of pick up and play levels with a few genuine challenges. Go on. Save that pink thing.